Addendum: Apparently, for those in the World and possibly in the U.S., there are two different oil pans fitted to CBR 1000's. It is important to remove your old pan to see which type you have. Externally, one type will have a cast in feature that resembles a dog-bone, the other will not. Internally, one without the dog-bone feature will have a raised circular well cast in. This I can only surmise has to do with regulating the flow of return oil to the sump. The bikes that use the oil pan with the dog-bone will have a fitting from the bottom of the engine that has a large barrel shaped mid-section with a smaller opening for the return oil. Extensive research of parts supplier microfiches in the U.S. have shown that the oil pan without the dog-bone feature is more common to the CB1000 models of the early 90's. 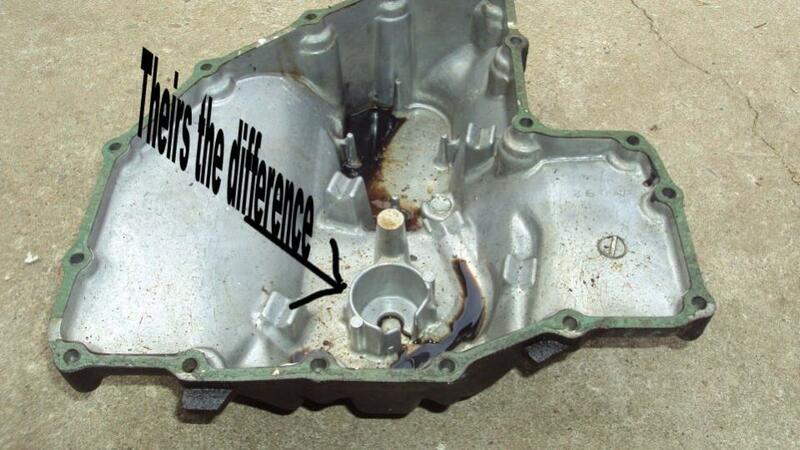 Look carefully before buying any oil pan. Yes, the '95 pan does bolt up. Identical markings and everything. 11210-MS2-305. Honda part number for Oil Pan '90-'91 Approx. $140.00 U.S.
11210-MAZ-010. Honda part number for Oil Pan '93-'96 Approx. $142.00 U.S. Above part numbers for '90-96 are replacement numbers. Original part number is, 11210-MZ2-610 for those years. These part numbers were gathered from cheapcycleparts.com fiches. 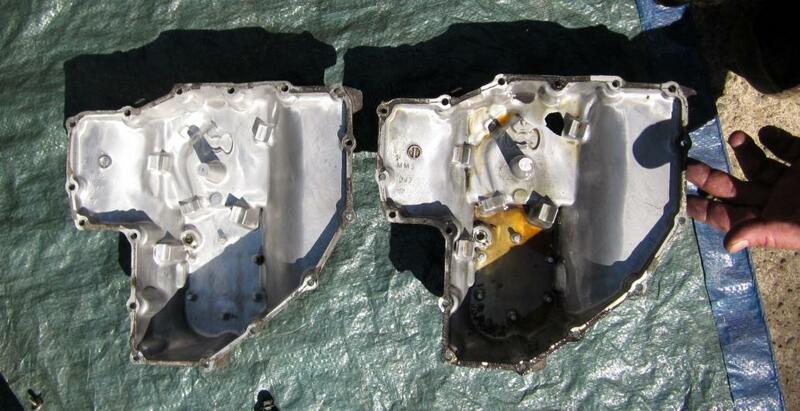 My own practical experience is fitting a '95 pan to my '87 motor on a U.S spec, Non-CA bike. JDM and World bikes may differ. TK and Everyone Worldwide, for trying to source me a replacement. Last edited by wooferdog; 07-20-2012 at 02:49 PM. Last edited by Sprock; 07-13-2012 at 06:54 AM. Great thing when a plan comes together with success there Woofer pics look good. I'm curious. There was no CBR1000 fiches for the '89 and '92 years. Went back to the '94 fiche that I took the part number from and their illustration shows none of the features your pan does. Though that might only mean they didn't bother to update the drawing. It raises the question. Is what I received off of a '95 bike but not a '95 pan? Last edited by wooferdog; 07-15-2012 at 10:19 AM. Nope I think you got a 95 pan Woofer and that 94 pan of Shakeys Mate I'd be having questions about ? Last edited by Sprock; 07-15-2012 at 12:25 PM. All figured out - Shakey that sump is from a CB 1000 !!!!! Last edited by Sprock; 07-15-2012 at 12:30 PM. Last edited by wooferdog; 07-15-2012 at 01:17 PM.